Dysport® was first approved for use in the United States in 2009 and is now used worldwide in 57 countries to treat women and men for aesthetic purposes. It is the perfect cosmetic injection treatment if you are looking for a way to smoothen the appearance of frown lines between your eyebrows. 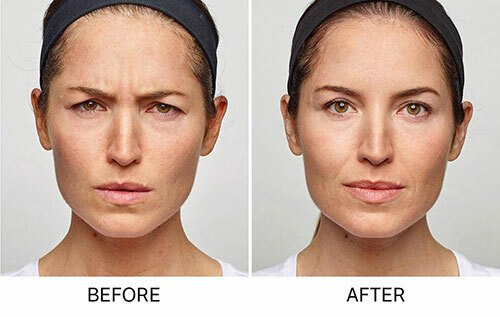 Dysport® works only on the facial muscles that are targeted, providing an improvement in frown lines without the “overdone look” and changing the expressions of your entire face. One injection of Dysport® into each of the five points surrounding your eyebrows works to temporarily prevent the muscle contractions that promote frown lines. By reducing the specific muscle activity in this area, wrinkles are prevented while the rest of your face remains free to move naturally. Taking less than 20 minutes, the treatment is virtually painless and has minimal downtime, allowing you to get back to the things you love doing faster. At Midtown Med Spa, our clients see the results from Dysport® in as little as two days after treatment. Q: Who is the ideal Dysport® user? A: Dysport® is the treatment of choice for both women and men who are under 65 and looking for a way to improve the look of wrinkles between their eyebrows. Q: How long does a Dysport® treatment take? A: Dysport® is a quick 10-20 minute treatment with minimal downtime so it lets you get back to your daily routine faster. Q: How long will it take for Dysport® treatment results to show? A: It takes 2 days to 2 weeks for you to see the frown lines between your eyebrows disappear after one Dysport® treatment. Q: How long should I expect the results from one Dysport® treatment to last? A: The effects of Dysport® are known to typically last up to 4 months. Q: Are Dysport® and Botox® the same thing? A: Dysport® and Botox® both work the same way: they temporarily block the nerve impulses of the target muscle. But the main difference between them is at the molecular level: Dysport® has fewer proteins surrounding the molecule which means your body can absorb it quicker (see results quicker) and that it remains active longer (so you need fewer treatments to retain your look).